Dropinn – the Icelandic charity for children with diabetes was founded in 1995. 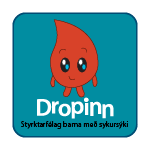 Dropinn (Icelandic for „The Blood Drop“) is a voluntarily-run charity for children with diabetes. Membership is open to children with the condition, their families, relatives and carers. Our mission is to improve the lives of children with diabetes by providing practical support and information. We are also committed to representing the interests of children with diabetes by lobbying the government for better standards of care and the best possible quality of life. One of our two key functions is to run events where children with diabetes meet other children with the condition and their families to share and learn from each other in a relaxed and fun environment. Our other key function is to operate the Dropinn summer camps. Our so-far annual support holidays are packed with fun, activities and adventure – offering a unique opportunity to be among people who understand. Developing a positive attitude and establishing self-confidence in the management of diabetes are among the holidays’ main aims. The summer camps are supervised by qualified staff and instructors who are very aware of the needs of children and teenagers with diabetes. Doctors and nurses provide daily supervision of the children’s diabetes management, with meals planned to meet everyone’s individual needs. The programme schedule is designed to develop the children’s understanding of their diabetes whilst having fun.